Streetscape Furniture / Engineered Products — Special Trackwork, Railway Track Material, Rail Section, Icosit, Railroad Clips London Trackwork Inc. - Special Trackwork, Railway Track material, Rail Section, Icosit, Buffer stops, Mine clips, etc. London Trackwork Inc. (LTI) is a supplier of many other products including Forgings, Rolled Rings, Castings, or the full range of streetscape furniture including custom manhole covers, security post and manhole cover and steel tree grates. Castings: Various Types of Steel, Iron, Brass and other materials. 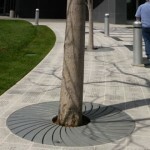 Including Bollards, Tree Grates, Decorative Benches, Manhole Covers, etc.